The old adage says that momentum is only as good as the next day’s starting pitcher, and the Yankees had plenty of momentum when they relied exclusively on their three best starters during their run to the 2009 World Title. That resulted in tremendous workloads for CC Sabathia (266.1 IP), A.J. Burnett (234.1 IP), and Andy Pettitte (225.1 IP), enough that Brian Cashman was concerned about a carry-over effect in 2010. Despite having Joba Chamberlain, Phil Hughes, Chad Gaudin, and Sergio Mitre in tow, he went out an acquired one of the game’s proven workhorses, bringing Javy Vazquez back to New York in a December trade with the Braves. Vazquez had been treated as the scapegoat for the 2004 ALCS loss ever since being traded to the Diamondbacks as part of a package for Randy Johnson after that season, but life goes on and he continued to pitch. His lone season in Arizona featured a 4.06 FIP in 215.2 IP, but he demanded a trade during the offseason to be closer to his family on the East Coast, his contractual right. The D-Backs shipped Javy to the White Sox for a package built around young centerfielder Chris Young, and he went on to post a 3.80 FIP in his three seasons on Chicago’s south side. After a 2.77 FIP in 219.1 IP for the Braves in 2009 (and a fourth place finish in the Cy Young voting), Vazquez found himself back in the Bronx. Javy had thrown no fewer than 198 innings every year since 2000 (only one season below 200 IP during that stretch), and only that Randy Johnson guy had struck out more batters in that time. Unlike 2004, when a then-28 year old Javy Vazquez was expected to be a cornerstone in New York’s rotation going forward, the 34-year-old version was expected to do nothing more than soak up innings at the back of the rotation. Two-hundred league average innings was all the team needed out of him, and after the season the two sides would part ways with the Yanks landing two high draft picks as compensation when he signed elsewhere. To say the 2010 season started inauspiciously for Vazquez would be an understatement. His very first pitch of Spring Training went for a solo homer off the bat of Jimmy Rollins, a sign of things to come. Javy’s first start of the season resulted in eight runs allowed to the Rays in just 5.1 innings, and five days later he was booed off the mound in Yankee Stadium after surrendering four runs in 5.1 innings to the Angels. Vazquez’s first five starts were simply atrocious, a 9.78 ERA with eight homers allowed in just 23 IP. Opponents were wOBA’ing .457 off the Yanks’ fourth starter, and things got so bad that the Yankees had to skip his turn in the rotation in early May just to figure out what they should do. To his credit, Javy rebounded from the rough start and pitched very well for about two months. He started 11 games (and made one relief appearance) from mid-May through mid-July, pitching to a 2.75 ERA (3.66 FIP) and holding opponents to a measly .249 wOBA. Vazquez was the team’s best starter not named Sabathia during the stretch, and he was giving the Yanks everything they asked of him and then some. Unfortunately it was all downhill from there. The Angels tagged Vazquez for five runs in five innings on July 21st, and he allowed four or more runs in four of six starts after that stretch of brilliance. Even worse was the obvious physical decline. His fastball, already down two miles an hour from last year, was now regularly sitting in the mid-80’s (right). His breaking balls were flat and lacking depth, leaving the changeup as his only consistent weapon. That didn’t last very long, as Javy was yanked from the rotation for good after allowing four runs in three innings against the lowly Mariners on August 21st. He pitched to a 6.59 ERA the rest of the way, mostly in long-relief though he did make three spot starts. The low point came in his second to last appearance of the season, when he hit three straight Rays to force in a run, turning a blowout into a full-blown laugher. Perhaps all those innings finally caught up to him and/or he was hiding some kind of injury. Doesn’t matter now. All told, 2010 amounted to the worst season of Vazquez’s career. His 154.2 innings were his fewest since 1999, his 5.32 ERA his worst since 1998, and his 5.56 trailed only Ryan Rowland-Smith (6.55) and Scott Kazmir (5.83) for the worst in baseball among pitchers that threw at least a hundred innings. If he hadn’t been mercifully pulled from the rotation late in the year, he would have led baseball in homeruns allowed. As it stands, the 32 he gave up were the fourth most in the game, and his 1.83 HR/9 was second worst. The Yankees paid him $11.5M and received -0.2 fWAR in return, meaning Javy was no better than some Triple-A fodder toiling away in the minors. To make things worse, Vazquez pitched his way out of Type-A free agent status, falling down into Type-B range. Not that the team would offer him salary arbitration after such a horrible year, but they wouldn’t even have been able to get those two high draft picks even if they wanted to risk it. We know the Yanks didn’t give up much for Vazquez thanks to the benefit of hindsight. Melky Cabrera was the worst everyday player in baseball this season (-1.2 fWAR, min. 450 PA) and has already been released. They didn’t even wait until the non-tender deadline. Mike Dunn has a live arm but has already been replaced by Boone Logan. The x-factor is prospect Arodys Vizcaino, who put together a 2.22 FIP in 114 IP before suffering an elbow injury. He’s a top 100 prospect, and if he comes back well from the injury, the Yanks will regret the deal even more. Brian Cashman and the rest of the Yankee brain trust wasn’t asking for much out of Vazquez. They wanted 200 league average innings, which meant an ERA right around 4.20. All they wanted was someone to take the pressure off the three guys at the front of the rotation and young Phil Hughes in the back, someone they could ride hard all year and count on for length each time out. Vazquez didn’t give them that at all, pitching so poorly that he couldn’t even beat out Dustin Moseley for a spot on the postseason roster. Expectations were relatively low, and Javy failed to deliver on even that. The Arbitration Question: To Offer Or Not? The free agent signing period officially starts this Sunday, but free agency won’t begin in earnest until later this month when we know which players will force teams to give up a draft pick to sign them. Some are obvious; the Cliff Lees, the Carl Crawfords, the Jayson Werths, those are the ones we don’t have to think about. They’re going to cost you. But with players like Paul Konerko, Carl Pavano, and Frank Francisco, it’s not so obvious. That’s why we have to take the wait and see approach. Quick primer on the rules: If a team offers one of their free agents arbitration and he signs elsewhere, they’ll receive two draft picks if he’s a Type-A (the signing team’s top pick and a sandwich rounder pulled out of the air) or just one if he’s a Type-B (the sandwich rounder). Of course the player has to decline that arbitration offer for the team to be entitled to that compensation, which is no longer a given these days. Salaries are coming back down to Earth and teams are shying away from older players, so the chances of these guys accepting arbitration has gone up considerably in recent years. But you knew that already. The Yankees haven’t offered arbitration to any of their free agents in the last two offseasons, and there’s really no reason to expect them to alter that practice now. The last compensation pick they received for losing a free agent came way back in 2008, when they gained a supplemental first round pick for losing Luis Vizcaino (they used the pick on Jeremy Bleich). Yeah, it’s been a while. Derek Jeter, Mariano Rivera, and Andy Pettitte all qualified as Type-A free agents, and we know that it’s pretty much Yankees or bust for those three. Since the chances of them signing with another club are tiny, I don’t see the point in offering them arbitration. There’s nothing to be gained by it, and an offer would put all of the risk on the Yankees. There are worse things in the world than having those three on well, well above-market rate one-year deals, but I don’t think that’s enough of a reason to assume the risk given the tiny chances of the reward. Perhaps you feel differently. When the Yanks acquired Berkman at the trade deadline, he waved his no-trade clause under the condition that they would not pick up his $15M option for 2011. Usually it’s the other way around, the player wants the option picked up in exchange for agreeing to the deal. I guess that means Puma really doesn’t want to stick around and plans on exploring the open market this winter. Under normal circumstances, there’s no way you’d offer Berkman arbitration given his bloated salary and declining production (yes, I know he was pretty good with the Yanks, but his .345 season wOBA was the worse of his career), but this isn’t a normal situation. Berkman’s demonstrated a desire to get out of town by demanding that they decline his rather lucrative option, and unless he’s had a change of heart over the last few months, I think they should offer Fat Elvis arbitration and hope he declines. Yeah, it’s very risky given his salary and the team’s not infinite payroll, but I think there’s enough writing on the wall to risk it. Granted, it’s not my money, so what do I know. If Berkman was a Type-A instead of a Type-B, I definitely wouldn’t offer because a team is unlikely to give up a high pick to sign him. But since that’s not the case, I say go for it. Be bold. Wood earned $10.5M this year, which is a boat load for a reliever, even a closer (which he was at the start of the year). In fact, he was the seventh highest paid relief pitcher in baseball this season, just ahead of B.J. Ryan. Yeah, the Blue Jays are still paying that guy. Anyway, Wood (a Type-B like Berkman) will probably be able to find a job closing games somewhere, but he’s not going to sniff that kind of annual salary again. Remember, he was on the disabled list twice before the trade, and his 26 innings with the Yankees were unfathomable lucky (6.23 BB/9, .235 BABIP, 98.1% strand rate). Considering those three things (improbability of finding that much money on the market, his health track record, and unsustainably good performance), I’d wish Kerry good luck and decline to offer him arbitration. If he accepts and you’re stuck with a $11-12M setup man … yikes. The Yanks have money, but that doesn’t mean they should spend it stupidly. Sorry Kerry. So assuming the Yanks offer arbitration to Berkman and Berkman only, they’ll receive one extra draft pick next year if/when he declines. Not much, but it’s better than nothing in a stacked draft class, especially when the Yanks are expected to forfeit their first round pick to sign a Type-A free agent of some kind. The deadline to offer arbitration is Nov. 23rd and players then have seven days to accept or decline, so this is going to sneak up before we know it. This winter’s Elias rankings are out, and MLBTR provides the goods. Lance Berkman, Kerry Wood, and Javy Vazquez all qualify as Type-B free agents, meaning the Yankees will receive a supplemental first round pick in next year’s draft if they sign elsewhere. Derek Jeter and Mariano Rivera unsurprisingly check in as Type-A’s, so in the unlikely event that they sign elsewhere, the Yanks would receive both a first rounder and a supplemental first rounder. Of course, the Yankees have to offer each player salary arbitration to receive those compensation picks. The Yanks haven’t offered anyone arbitration in the last two years, and there’s no reason to expect them to start now. Berkman might accept given his salary ($14.5MM), ditto Wood ($10.5M). They’re unlikely to get that big of a payday on the open market, and regardless of how good they were down the stretch in New York, that’s just too much for spare parts. Forget Javy, no chance they offer him arbitration. Just sever ties and move on. As a reminder, our 2011 Draft Order Tracker is up and running, so check back in throughout the offseason as picks change hands during free agency. Yankee fans went to sleep on the night of December 21, 2009 with rumors swirling. We knew that the Yanks were on the verge of acquiring a starting pitcher, but we didn’t know, until the next morning at least, that Javier Vazquez would return to the Bronx. Even though our last meeting with Vazquez was an infamous one and we knew Brian Cashman was rolling the dice on a risky trade, we liked the deal. And how could we not? For Melky Cabrera, an overrated player on the verge of making more money than he’s worth, the replaceable Michael Dunn and Arodys Vizcaino, a live arm years away from making his Major League debut, the Yanks landed a lefty reliever and one of the top National League hurlers. Lest we forget with the bad taste of 2010 still in our mouths, Javier Vazquez won 15 games with a 2.87 ERA in 2009 with a 9.8 K/9 IP, a 1.8 BB/9 IP and just 20 home runs allowed in 219.1 innings. He deservedly finished fourth in the Cy Young voting. What a difference a year makes. If last night was Javier Vazquez’s final appearance as a member of the New York Yankees, his season totals are abysmal. He’s 10-10 with a 5.32 ERA and a FIP even higher than that. In 157.1 innings, he struck out 121, walked 65 and gave up 32 home runs. His home run rate more than doubled over 2009 while he lost over three strike outs and walked two more batters over nine innings. He hasn’t won a start since July 26. Vazquez couldn’t have been much worse for the Yanks, and few pitchers have. In two seasons six years apart, Vazquez has gone 24-20 with a 5.09 ERA. His rate stats — strike outs, walks and home runs per 9 innings pitched — than compared with his career totals, and he again seems to have lost the ability to get men out. No pitcher in Yankee history has made as many starts as Vazquez while being so prolific at giving up the long ball, and only Sterling Hitchcock, Tim Leary and Andy Hawkins have as many innings pitched with higher ERAs than Javy. For a brief spell in the middle of the season, it appeared as though Javy had figured it all out. After starting the season 1-4 with an 8.10 ERA in his first six games, Javy went 8-5 over his next 16 games with a 3.39 ERA. He allowed just 13 home runs over those 95.2 innings and kept runners off base. His last 10 appearances though have seen him allow 11 home runs in 38.2 innings while opponents are hitting a Robinson Cano-like .302/.387/.549 against him while walking 4.5 times per nine innings. Somewhere it all went wrong. Maybe it’s Javy’s head or maybe it’s something else. Maybe he can’t pitch in New York as many would have you believe or maybe he’s just not physically up to the task any longer. It’s not unheard of for 34-year-olds with 2500 innings under their belt to fall off a clip, and I think Javy’s problem can be summed up in graph form. His velocity, as we can see, has dipped significantly this year. During his time with the Braves, he threw in the low-to-mid 90s; with the Yankees, he’s barely cracked 89, let alone 90. He stopped being able to blow hitters away, and he stopped being able to mix his pitches effectively. It was a long hard fall. So as Javy has likely thrown his last pitch in a Yankee uniform, Joel Sherman threw an obvious pitch into the mix this morning. The Yankees, he says, will not offer Javy arbitration. The Yanks swallowed hard and traded Arodys Vizcaino last winter because they hoped to turn Javy into a first-round draft pick. Now that Javy’s been worth below replacement level according to Fangraphs’ WAR, the team won’t be offering him and his $11.5 million salary arbitration, and they won’t recoup some of the cost it took to acquire him. The inevitable question then concerns the trade. Was it a good one? Without the luxury of hindsight or a crystal ball, there’s no way to know that Javier Vazquez’s 2010 would be this bad, and the cost to acquire him is high only if Arodys pans out. I can’t fault the Yanks for trying in December, but no one should whitewash Javy’s poor finish. One thing is certain: I’ll be calling this the Boone Logan trade from now on. A few people will miss Javy Vazquez, but I’m sure the overwhelming majority were glad to see Joe Girardi come out of the dugout and remove him from the game for the final time in his Yankee career. Vazquez gave up hard-hit ball after hard-hit ball in his 4.2 innings of work, which resulted in seven Blue Jays runs. The bullpen would hold them down, but the offense couldn’t capitalize on a rally and ended up dropping their 10th game of the season against the Blue Jays 8-4. Entering the game Vazquez had allowed 29 home runs, giving him the highest HR/9 rate in the league among pitchers with 150 IP. That went up in a hurry. A night after he recorded the Blue Jays only run on a homer off CC Sabathia, Travis Snider took Vazquez deep in the Jays’ first at-bat. Vazquez gave up a number of hard-hit balls that inning, but did manage to escape without allowing another run. That would have to wait until the second. With none on and two outs in the second John Buck whaled a low, outside pitch over the wall in right-center, giving the Jays a 2-0 lead. Then in the fifth, this time with two men on, Vazquez gave up another long fly, this one to Aaron Hill. That made the game 7-0. That is almost certainly the last pitch he’ll throw as a Yankee. I know there are plenty of fans who revel in Javy’s failures in pinstripes, but I’m as saddened by the end of his second stint as I was at the first. After 2004 I was sure that he would bounce back with a solid 2005. Trading him for Randy Johnson, I thought, was not such a great idea. This time around I realize that he has to go. He’ll sign for cheap somewhere, and while in a way I’d like that to be with the Yankees, I realize the impossibility of the idea. The Yanks actually fought their way back into the game in the sixth inning, right after Royce Ring came in and ended the game-killing fifth. A-Rod led things off with his 30th homer of the season, which gave him his 14th 30 HR, 100 RBI season, and his 13th straight. After Brett Cecil plunked Robinson Cano and walked Austin Kearns the Yanks had a shot. Cervelli started the carousel, singling in Cano and moving Kearns to third. The mighty Greg Golson followed with his own single, which set up the Yanks with first and second with one out and drove Cecil from the game. In came Jason Frasor, who gave up a single to Derek Jeter. Nick Swisher came to the plate as the tying run, and he was backed by Teixeira and Rodriguez. But Swisher swung at the first pitch and grounded it to Aaron Hill, who started an inning-ending 4-6-3 double play. Francisco Cervelli in September: .367/.512/.433 in 43 PA. BABIP: .440. Hot and cold, hot and cold. Alex Rodriguez has 40 fewer PA than Miguel Cabrera but has driven in just three fewer runs. A-Rod might be having a sub-par season by his standards, but he’s still coming up with men on base (.300/.372/.571). If Mark Teixeira catches A-Rod’s throw Joba’s appearance looks a lot better. At this point, is Sergio Mitre a better option than Chad Gaudin for the postseason roster? Ideally they’d carry neither — in fact, I submit that Royce Ring is a better choice then both. I coulda done without this one. More at FanGraphs. Boxy thing here. It’s an off-day as the team heads back stateside and into Boston. Andy Pettitte and Daisuke Matsuzaka do battle on Friday. You could see it happening. It was that ugly seventh inning of last night’s game, the inning when starter turned mop-up man Javy Vazquez fell completely off the rails. A walk then three consecutive hit batters to force in a run. That from a guy who had hit four batters in his first 149.2 innings of the season and has demonstrated good enough control to unintentionally walk just 2.1 batters per nine innings pitched this century. The game was basically lost by that point anyway, but in the big picture it was the moment that Vazquez lost any chance to ever pitch another meaningful inning in pinstripes. What happened in the last two innings was completely irrelevant, his fate had already been decided. 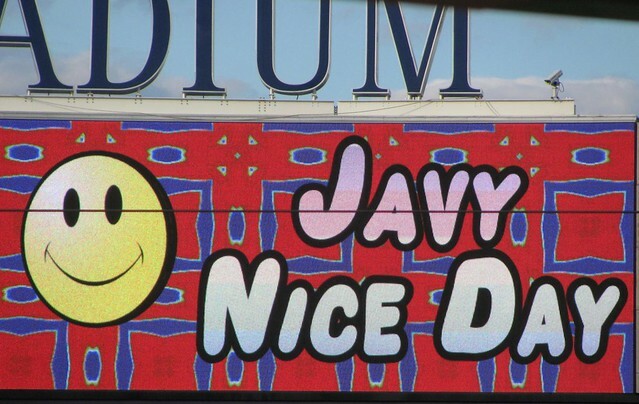 I wanted to like Javy, and I still do like him actually. He’s an extremely nice and self-deprecating guy, or at least he comes across that way in interviews, but that doesn’t count for anything on the mound. While I certainly appreciate that mid-season stretch when he was arguably the team’s best pitcher, he’s been basically unusable since mid-July. The Yanks tried tinkering with his mechanics, tried giving him extra rest, tried him in the bullpen, but the results just aren’t there any more. The stuff, to put it kindly, has deteriorated to junk, and he hasn’t been able to adjust to it yet. That’s not to say that Javy is a lost cause forever, remember it took Mike Mussina a year or so to figure out how to pitch with his mid-80’s gas. But for the Yankees, that’s it, any chance Vazquez had at redeeming himself was washed away when that curveball hit Kelly Shoppach in the back to force in a run last night. There’s almost no chance of him making the postseason roster even as the “break glass in case of emergency” 11th reliever, there’s absolutely no chance of the Yanks offering him arbitration after the season even though he projects to be a Type-A free agent (by the skin of his teeth). Sure, Vazquez will throw some garbage time innings when they’re resting the regulars next week, but if it wasn’t obvious before, it is now. He’s just too unreliable for a team trying to win a World Championship, and he won’t get another opportunity to prove himself. It’s kinda sad when you think about it, especially since the trade was pretty well-received at the time. The Yanks gave up so little for a guy that seemed certain to give them 200 innings of at least average pitching. Arodys Vizcaino had never pitched in a full season league, Mike Dunn is a usable bullpen piece but hardly a shutdown reliever, and Melky Cabrera was about to get super expensive ($3.1M salary this year [!!! ], and just think, if the Melkman was still around, he’d have taken at-bats away from Brett Gardner). All three were easily replaceable, and effectively have been already. Anyway, back to Vazquez. The anti-Javy crowd that maintain that he can’t handle New York will think they’re right when in reality it was just his stuff that betrayed him. The fastball velocity is gone, the breaking ball doesn’t bite anymore, and the changeup isn’t as effective as it used to be because the fastball isn’t there to back it up. It’s gone downhill so quickly that I can’t help but wonder if he’s hiding an injury. And if he is I guess it’s admirable, but he did himself nor his team any good by pitching through it. If an offseason of rest manages to help him get healthy, some East Coast National League team is going to get a pretty sweet deal when they sign Javy for one year and about $4M this winter (my money’s on the Marlins, nice and close to his home in Puerto Rico) and he gives them bulk innings against lesser competition. Either way, last night was almost certainly the last time he’ll ever pitch in the Bronx as a member of the Yankees, and ironically enough, there weren’t enough fans left at the park to boo him off the mound.